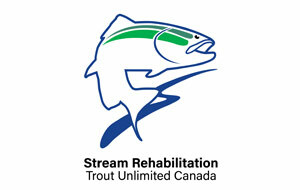 Fish access projects have been an outcome of this program on several of our streams; most recently, Annie Creek. 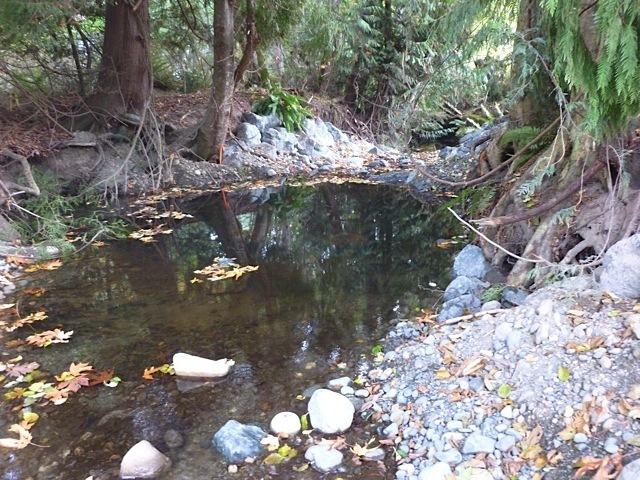 With the help of BC Ministry of Transportation’s Sean Wong, construction of two rock riffles downstream of the highway culvert crossing was undertaken to address the impediment of upstream migrating juvenile salmonids and, possibly, Cutthroat Trout and Coho during low water flows. 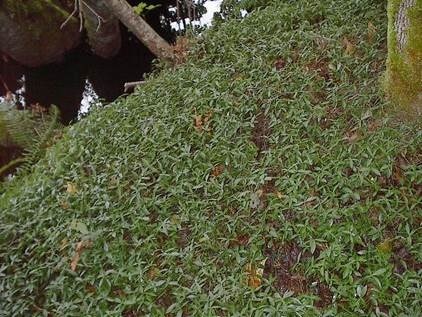 Because of the necessity of stripping large amounts of vegetation during the construction, a group of NCES volunteers, with the help of some local businesses, set out to re-establish the natural setting by replanting the bank with native ferns, shrubs and trees. On October 9th, this group of volunteers gathered at the site under the direction of Richard Wahlgren, member and owner of Streamside Native Plants. Most difficult was the removal of a non-native, invasive species, such as Himalayan Blackberry, and a well-established creeping groundcover. The volunteers carefully removed and bagged these plants for disposal. Richard Wahlgren giving instructions to volunteers. With Richard’s help, a variety of young trees, ferns and shrubs, including Sword Fern, Big-Leaf Maple and Salal were “sited” for optimum spacing to maximize the growing conditions of the area; the amount of moisture, sun or shade, soil type and proximity to the creek. 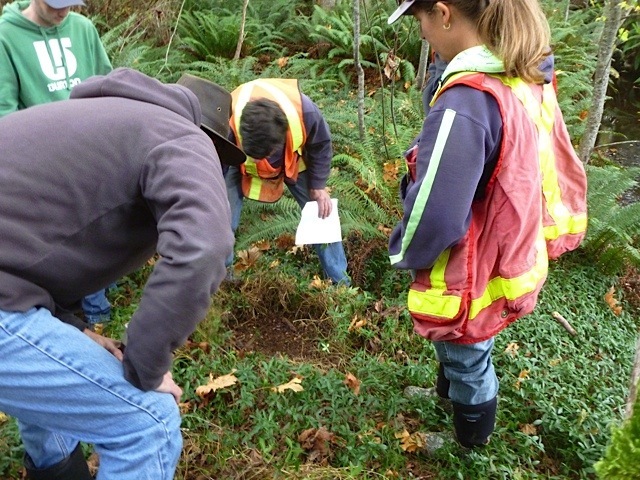 Soil was loosened and amended, holes were dug, and the native species were planted. 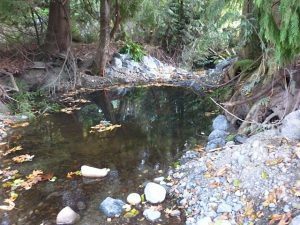 Although it takes time for a new planting to establish, success will be evident when you can pass by and see it blending again with the surrounding area, affording habitat for birds and animals and shade for the fish in the creek. 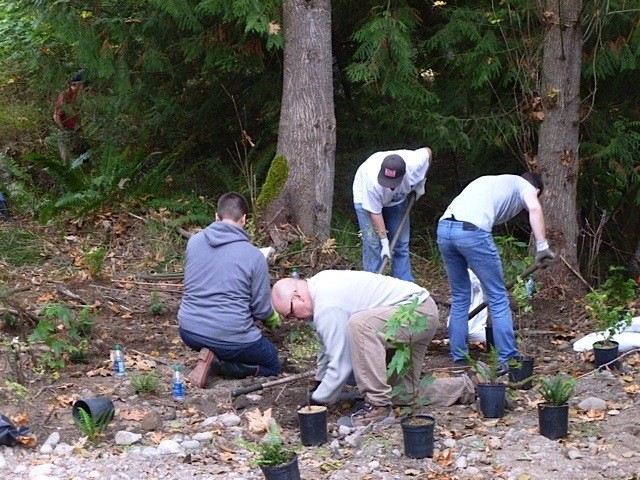 Many thanks to the volunteers who came out to plant: Ken Traynor, Susie Parkin, Mario and Aaron Mauro, Diane Nichol, Jack and Lynn Gillen and VIU students Jordan Brooks, and Bruce Keizer. This restoration project was aided by the continued support of local businesses, Streamside Native Plants, Lighthouse Feed and Garden and Bowser Builders’ Supply.